Immigration reform is a huge issue in Silicon Valley (and the rest of the country) right now, and we've seen a bevy of realistic proposals for dealing with a system that many describe as "broken." 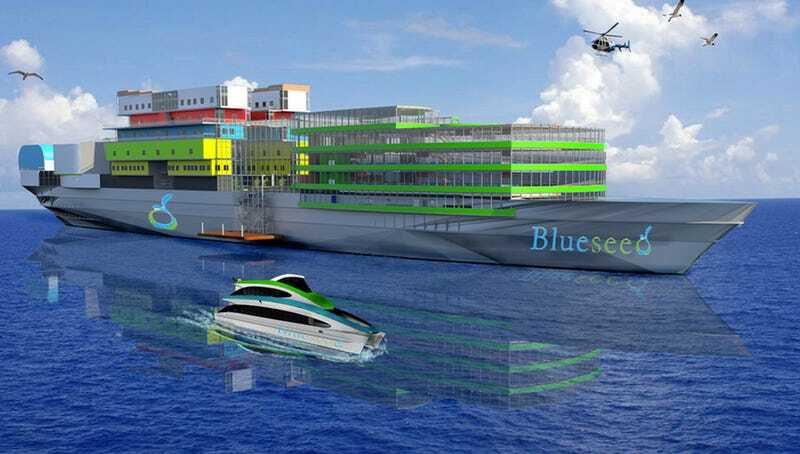 But Blueseed, a group of entrepreneurs aiming to build a floating city off the coast of San Francisco to house foreign tech workers who can't obtain visas, is definitely the wildest. The premise of the 2-year-old Mike Maples-backed startup is simple: give foreign workers a place to live that's close enough to commute a few times a week on a business tourism visa, but far enough that they don't need work visas. Blueseed's original plan was to launch the first ship by 2013, but this week the company revealed a scaled-back schedule and new information about the first voyage, which will take place on a plain old cruise ship (gulp) in 2014. Renderings from a few years ago showed us a custom-built vessel topped by two gigantic glass geodesic domes and a series of long green roofs. What's changed since then? A few things. First of all, according to Blueseed CTO Dan Dascalescu, the first Blueseed vessel will be a leased cruise ship, which will serve as a testing ground for future boats. Then, Blueseed will buy its own cruise ship and retrofit it to a tune of $50 million. The end goal, Dascalescu says, is still to build a brand-new boat. "Blueseed is a startup itself, and we value the 'lean startup' principle," he said. "That means that we need to be able to meet the demands of our customers (startup entrepreneurs themselves) without us requiring large capital expenditures upfront." What will it take to eventually retrofit a ship for tech work? At this point it's hard to speak to the technical challenges. But according to Houzz, who spoke to founder Max Marty on Monday, the ship's old cabins will be gutted and replaced with open plan office spaces, linked by a central promenade of shops and meeting spaces. Meanwhile, the old buffet area will house a coworking space. "I want to create more of a town-community feel," he said. "Cruise ships are designed for people to stay for a week or a month at the most. These people will be living here six months to a year." There's no real timeline for when the future Blueseed One will take to the sea. The company's idea of an April Fools' Day prank was to send out a fake press release claiming they'd launched their first vessel, complete with commando dolphins, thanks to funding from an "undisclosed Arab investor." Of course, the whole thing may never even get funded (after all, they still need to raise $18 of the $27 million it'll cost to launch any boat at all).